The new Mercedes-Benz E-Class Coupé has made its public debut at the Detroit motor show one month after order books opened in Britain. The two-door model is priced from £40,135, and first deliveries are expected to arrive in April. It's offered in the UK exclusively in AMG Line trim, meaning even the most basic models will come with a lengthy list of kit and 19in wheels as standard. The car on show in Detroit is an E 400 4Matic, but that model will hand the range-topping spot to an AMG-engineered E 50 4Matic mild hybrid model, which is due to be unveiled during the latter half of the year. To be launched as part of this year's extensive 50th anniversary celebrations planned for Mercedes’ AMG performance arm, the potent coupé will be among the first models to receive the German car maker’s all-new M256 in-line six-cylinder petrol engine that is set to have its debut in the S-Class. Running a conventional turbocharger in combination with an electrically driven compressor and a 48V electrical system, the 3.0-litre unit delivers 402bhp in standard guise. However, a series of tweaks, including higher boost pressure and internal modifications, are set to yield around 450bhp for the powertrain’s application in the E 50 Coupé. The new E-Class Coupé has been engineered from the ground up for a more upmarket positioning than that of its predecessor. The Mercedes-Benz E-Class comes with fine engines and a typically laid-back dynamic character. Not one for the interested driver, but a good advert for being disinterested. 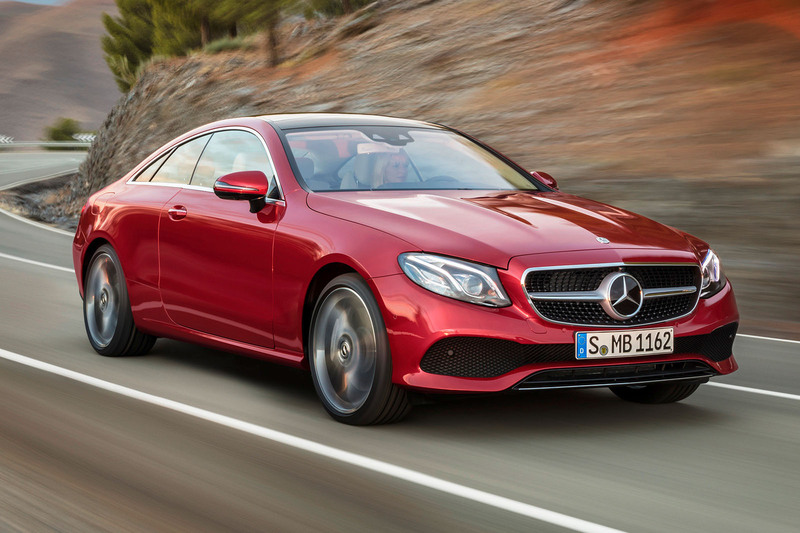 With the adoption of Mercedes’ latest MRA platform, the E-Class Coupé has grown both in size and positioning. Its length is up by 123mm to 4826mm, width has extended by 74mm to 1860mm and height has increased by 32mm to 1430mm. The wheelbase has also been extended by 113mm over that of its predecessor at 2873mm, while the front and rear tracks are up by 67mm and 68mm respectively, at 1605mm and 1609mm. The larger footprint provides the basis for a roomier cabin with an additional 18mm of head room, 50mm more shoulder room and 38mm more elbow room up front. The increase in interior space is mirrored in the rear, which gets an added 74mm of knee room, 15mm of head room, 34mm of shoulder room and 13mm more elbow room over the old model, which used the same platform as the superseded C-Class saloon. The design of the four-seat cabin leans heavily on that of other new E-Class models, but it has a number of bespoke touches, including newly designed air vents, automatically extending feeder arms for the front seatbelts and exclusive trim panels. Key elements include two optional 12.3in displays for the instruments and infotainment system, the latter being operable either via touchpads on the steering wheel or a rotary control and touchpad on the centre console. Outside, unique design features include a twin-blade grille and frameless doors. Three E-Class Coupés are offered at launch in the UK, with the choice of one diesel and two petrol engines, ranging in power from 191bhp to 328bhp. The line-up starts with the E 220 d Coupé, running Mercedes’ latest aluminium-block 2.0-litre four-cylinder diesel engine, which produces 191bhp. It is joined by the mid-range E 300 Coupé, which is powered by a turbocharged 2.0-litre four-cylinder petrol engine producing 242bhp. Prices for cars with this engine start at £41,025. 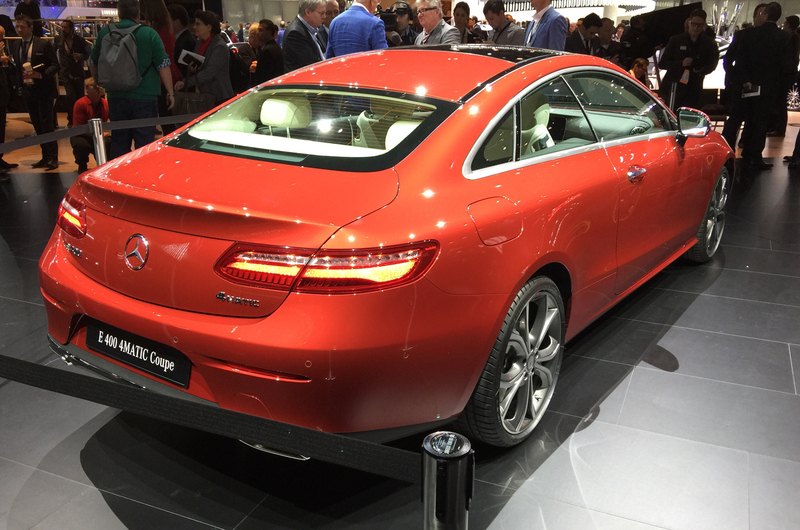 Crowning the regular line-up is the E 400 4Matic Coupé. It is powered by a twin-turbo 3.0-litre V6 petrol engine producing 328bhp and is priced from £50,775. All models come fitted as standard with Mercedes’ in-house-produced nine-speed automatic gearbox. The E 220 d Coupé and E 300 Coupé are rear-wheel drive, while the E400 4Matic, as its name suggests, comes as standard with Mercedes’ four-wheel drive system, which provides a nominal 45% front, 55% rear apportioning of drive. A choice of three different suspension set-ups are offered on the new two-door: a base steel-sprung Direct Control system, a steel-sprung Dynamic Body Control system with adaptive damping and an Air Body Control system with multi-chamber air springs. In combination with the Dynamic Body Control and Air Body Control suspension, the E-Class Coupé also gets Mercedes’ Dynamic Select system, which allows the driver to alter the characteristics of the car between four modes: Eco, Comfort, Sport and Sport Plus. Straight six with an electric turbo? Yes please. And whilst you're at it Merc, please can you fit it to a mini AMG GT the size of the M2 and chrage £50-60k for it? isn't hat what they are doing? The E is two sizes above the M2 / A class size. Suspect they'd need to build it on a shortened C class platform for RWD. If you were looking for anything sporty, why would you look at Mercedes? The M2 is more sporty then anything Mercedes has ever offered and probably allot more exclusive aswell. Cant think of anything that Mercedes does better then its rivals. xansamaff, that's the way the target audience like them, so don't complain when MB build a car that will sell as they intend. Personally I think the current S coupe is quite handsome but the C coupe looks like it melted around the edges a bit and this new E coupe leaves me cold. If Alfa did a Giulia coupe I'd be in the queue and the new Lexus LC500 looks pretty interesting (full fat only, not the hybrid thanks) but what would you opt for instead? OK Mercedes... We've all had enough now.. Please let this be the last of this over used design language.. I can't freaking tell the difference between all your cars now. This is verging on insanity. Bring back the W124 era. These new headlights that only exist to emphasize the grill have been an awful characterless design. Sleek and attractive is not in their vocabulary, sad to say. AMG V8 model they must on the new E -Class AMG. It look like bigger then then C-Class coupe. I like it. What the hell is going on with that rear quarter glass?! In an age of car manufacturers styling their saloons like coupes, Mercedes have managed to make their E class coupe look like a saloon. It looks slightly better when blacked out on the white model but I just can't shift my focus away from it on the red model. I'm usually a fan of big Merc coupes but this is just dull.